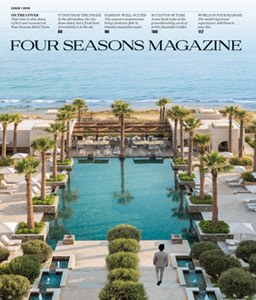 Four Seasons Magazine is the exclusive in-room magazine for the guests of Four Seasons Hotels and Resorts. The digital edition expands the experience of Four Seasons online, providing interesting and evocative content about some of the world’s most fascinating travel destinations. Four Seasons Magazine and this web site are designed and produced by Pace. Four Seasons Hotels and Resorts is dedicated to perfecting the travel experience through continual innovation and the highest standards of hospitality. From elegant surroundings of the finest quality to caring, highly personalised 24-hour service, Four Seasons embodies a true home away from home for those who know and appreciate the best. The deeply instilled Four Seasons culture is personified by its employees—people who share a single focus and are inspired to offer great service. To learn more about Four Seasons and our more than 100 hotels and resorts across the globe, visit fourseasons.com. For more than 35 years, Pace has developed branded content solutions for some of the world’s leading brands. Southwest Airlines, Toyota and Verizon Wireless, among others, have trusted Pace to create custom magazines, web sites, videos and other digital media designed to achieve their specific marketing objectives. To learn more about Pace, go to paceco.com. Receive special offers, upcoming events, inspirational travel ideas, and information on Four Seasons Residence Clubs and Private Residences.